The long running version of the DHY6000, equipped with a 30L fuel tank and with a maximum running time of up to 30 hours. Powered by a 4-stroke Hyundai D420 10hp diesel engine. Equipped with an AVR alternator for clean energy. Can be used with an ATS system for maximum convenience. The Hyundai DHY6000SELR is the long running version of the popular DHY6000SE, fitted with a large 30L diesel fuel tank which doubles the running time to up to 30 hours. This extended running time makes it the perfect standby generator for your home or business during times when the mains supply fails. Powered by a 4-stroke, air-cooled Hyundai D420 10hp diesel engine, the DHY6000SELR produces up to 5.2kW of clean energy. This clean energy is achieved via the AVR alternator which makes the DHY6000SELR perfectly safe to use with sensitive electronic equipment, such as laptops, televisions, phone/tablet chargers and so on. Like the DHY6000SE, the DHY6000SELR has ATS (Automatic Transfer Switch) capability and can be connected to an ATS system for maximum convenience. The ATS system will start the generator up automatically when a loss of power from the mains is detected, then turn it off again when power is detected from the mains. 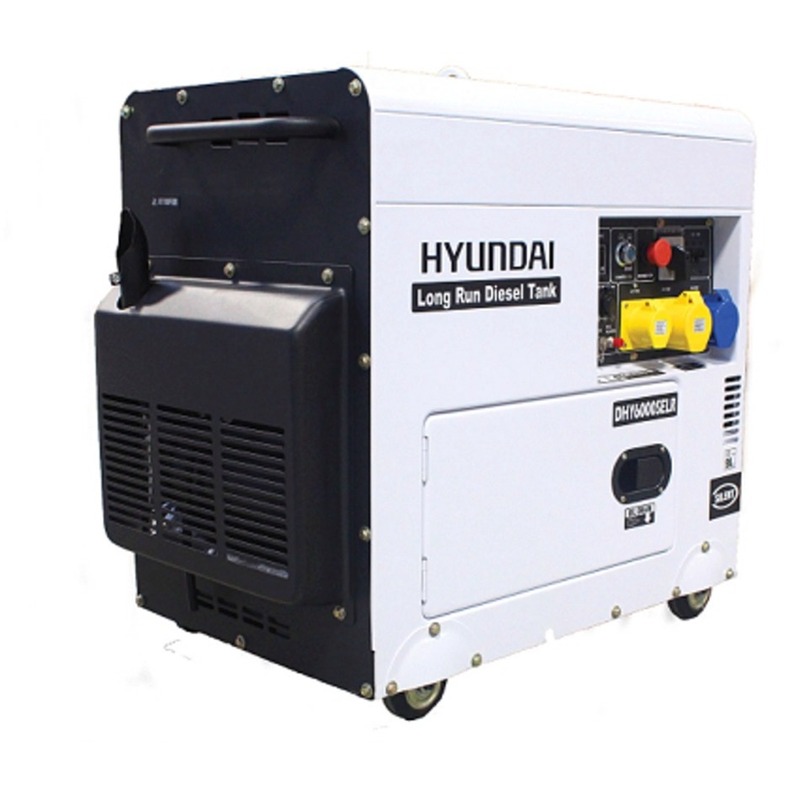 The DHY6000SELR is also an electric start generator, with the power being controlled with a simple turn of the key. Suitable for home standby or business standby use, the small and modern design of the DHY6000SELR makes it an attractive machine to have at your premises. The DHY6000SELR is also equipped with some stand out safety features, such as a low oil alert system and automatic engine shut off when the oil is too low. The user can easily keep track of their generator usage via a digital panel which displays the overall running time, digital voltmeter and frequency. Designed for standby use. For Continuous power supply, we recommend a 1500rpm diesel generator.